North and one of our good friends from Charlotte are running the Shut-In Ridge Run tomorrow morning. For those who don’t like to torture themselves on Saturday mornings and as such, aren’t familiar with this race, it’s an 18 mile run UP Mount Pisgah in North Carolina. Sounds grueling, huh? The fact that autumn finally decided to show up causing the temperature to plummet, means that I’m especially pleased with my role as spectator for this one. Since I am not concerned about how I’m going to drag my body up a mountain tomorrow, I’ve had plenty of time to consider more important things such as what I’m going to eat when I’m watching them. After all, this could take a couple of hours and spirit and enthusiasm might dwindle if I don’t keep my blood sugar up. Since it is rude to eat and not share, I wanted to bake something that not only could be enjoyed by me, but by the runners as well. Granola bars seemed like the perfect choice. I’ve meant to make homemade granola bars for a while now. The perfect snack for eating on the run (pardon the pun), they seem like good things to have around. A recipe for granola bars on Smitten Kitchen (one of my favorite food blogs) tipped me off to a recipe for chewy granola bars from the King Arthur Flour website. I made a few adjustments to the King Arthur recipe, including omitting the dried fruits and adding chocolate chips instead (they are running 18 miles after all). As suggested by Smitten Kitchen in her adaptation of the recipe, I used parchment paper to line the pan for easy removal of the baked granola mixture. 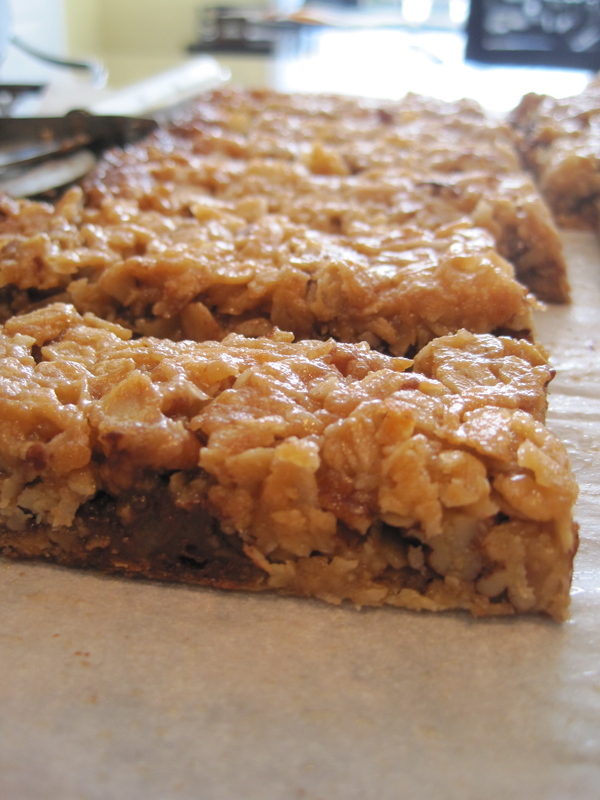 These granola bars are chewy, gooey and very yummy. In other words, they won’t last long. However, for those who have restraint they do freeze well. Add different nuts and dried fruits depending on your taste. Regardless of how you decide to personalize your granola bar, you’ll want to end up adding 2 to 3 cups (10 to 12 ounces) of nuts, dried fruits, and chocolate to the mixture. Preheat the oven to 350 degrees and place a rack in the middle of the oven. 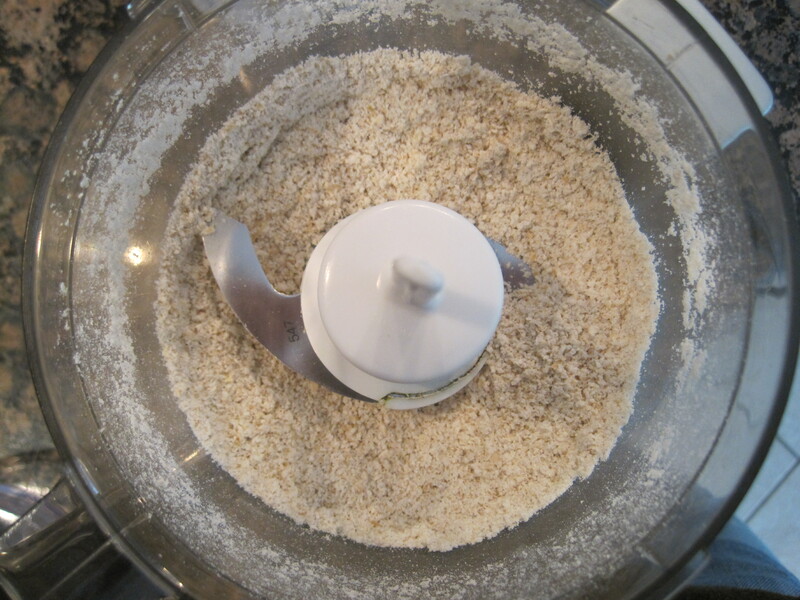 Put 1/3 cup of quick rolled oats in a food processor and process until it looks like flour. Add it and the remaining 1 2/3 cups of oats to a large bowl. 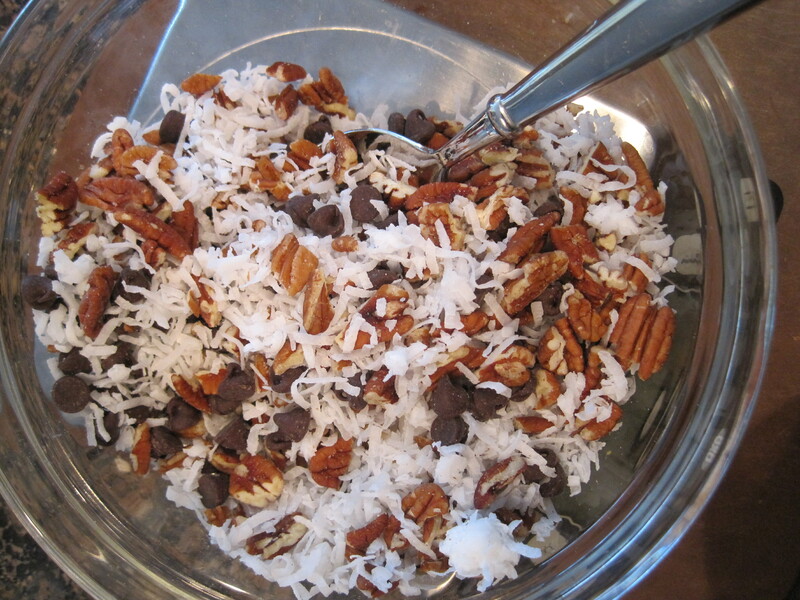 Add the salt, chocolate chips, flaked coconut, pecans, and sugar to the bowl and toss to coat. In a medium bowl, combine all the remaining ingredients. Whisk the ingredients together until combined. 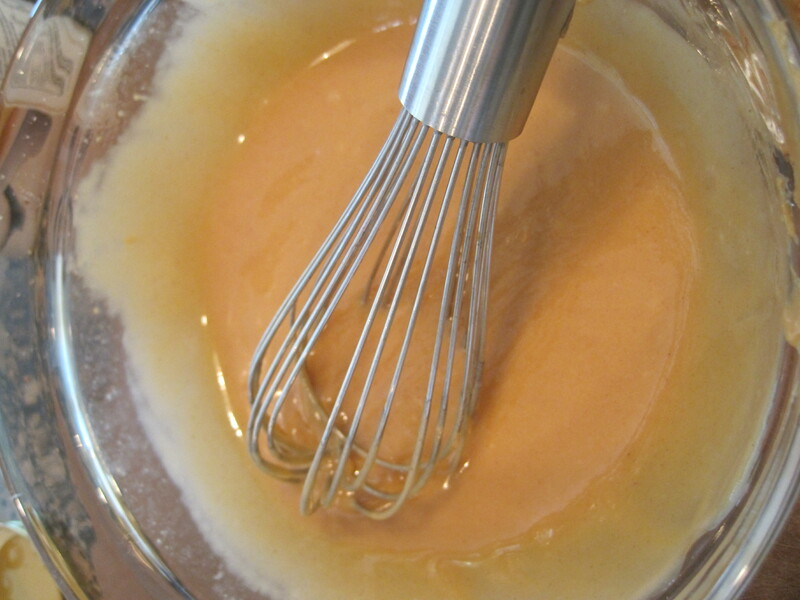 Pour the liquid ingredients over the dry ingredients and bring together with a rubber spatula until the ingredients come together. The granola mixture will be crumbly. 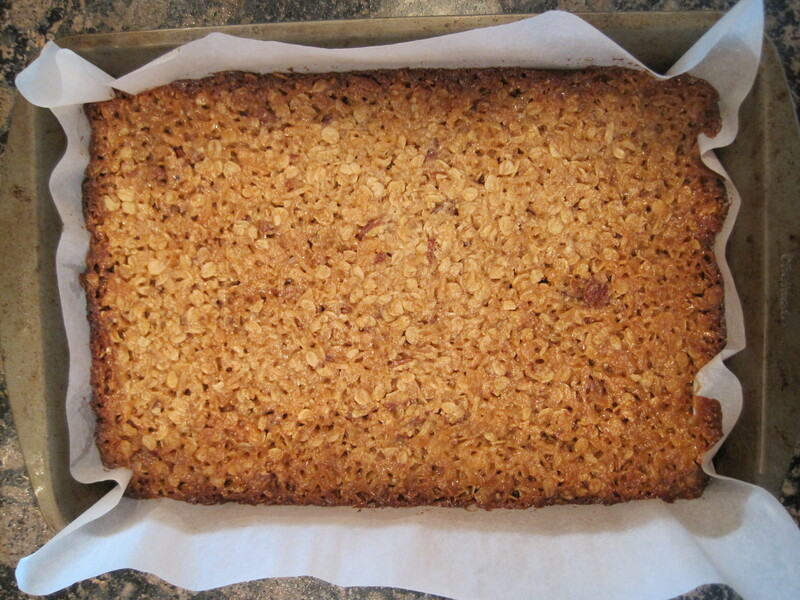 Place a large piece of parchment paper in a 9 by 13-inch metal pan so that the paper hangs over the edge of the pan (this will act as a sling later on providing easy removal of the baked granola bars from the pan). Lightly spray the parchment paper with cooking spray and then scrape the granola mixture onto the parchment paper. 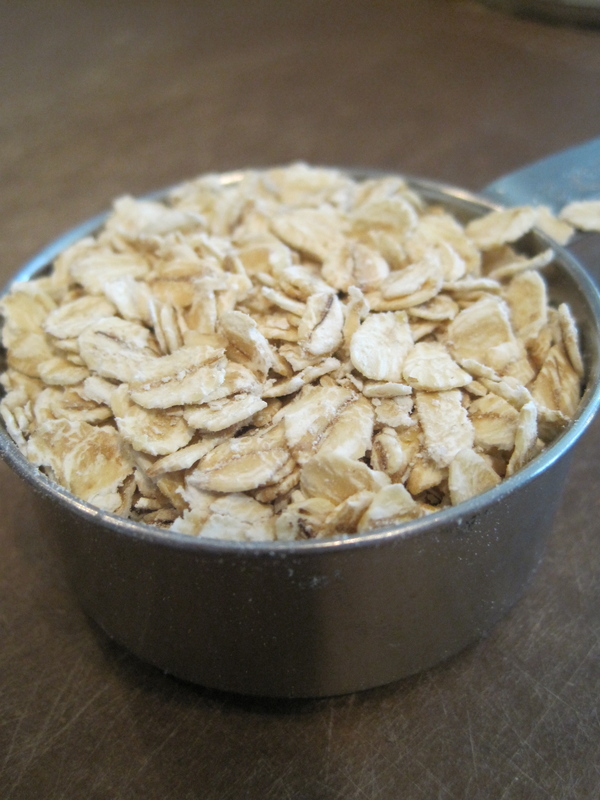 Shake the pan to distribute the granola mixture and then lay a piece of plastic wrap over the mixture. 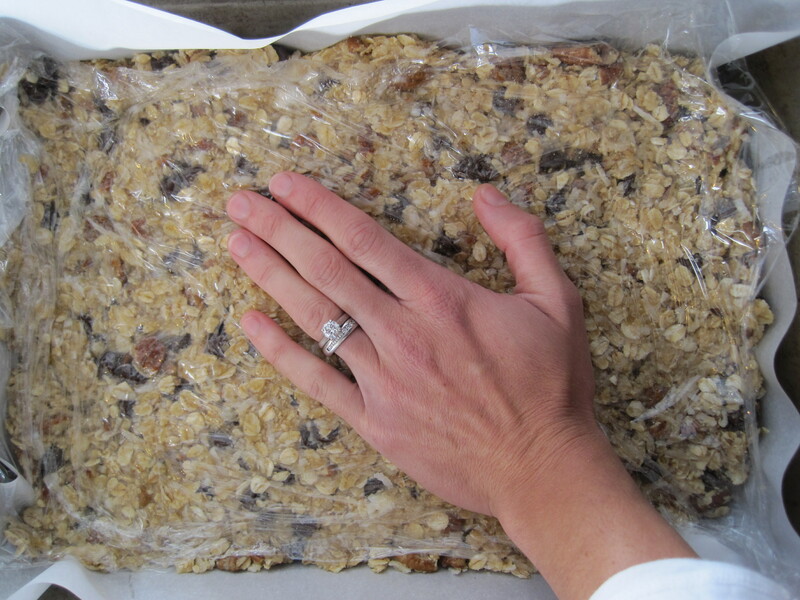 Evenly press the granola mixture into the pan (the plastic wrap will keep it from sticking to your fingers). Remove the plastic wrap and discard. 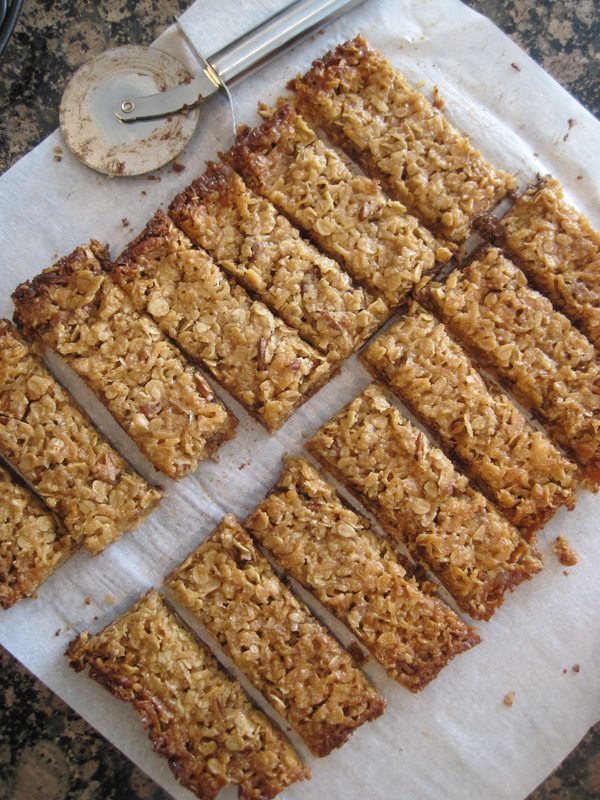 Bake the granola bars on the middle rack of the oven until golden brown, about 25 minutes. The edges will darken and start to bubble around 20 minutes, but you want to make sure that the pan is golden brown before removing it from the oven. Remove the pan from the oven and cool on a wire rack for 10 minutes. 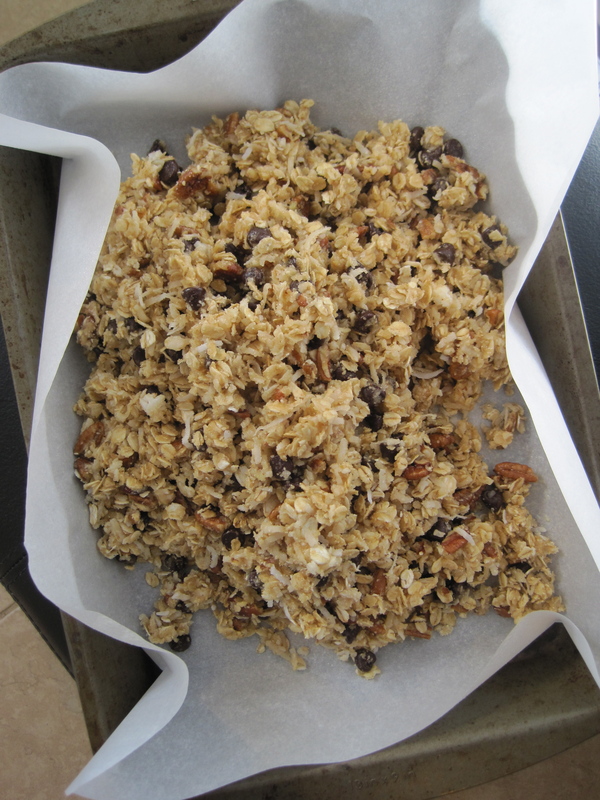 Use the parchment paper as a sling and remove the granola bars from the pan and set them on a counter. Cool for another 10 minutes before using a large knife or pizza wheel (I found this worked very well) to cut the granola bars into bars. Let the bars cool completely and then store them in an airtight container or freeze for later use. Enjoy! Thanks, Jillian. They are very yummy! I made these yesterday and they were amazing! They were quite the hit at playgroup and we didn’t even share them with the kids! I’m so glad that you are enjoyed them. Aren’t they delicious? Now I just need to come up with a little bit healthier recipe so that I can eat them all the time! Hope all is well in Richmond. These were amazing and really got me through the race! I would only run that craziness again so you make more bars. I even brought my extra with me to Toronto! Food Love is going global!